This pattern is one of the most-frequently discussed of simple configurations on SL. This shape would usually arise from a diagonal contact sequence. 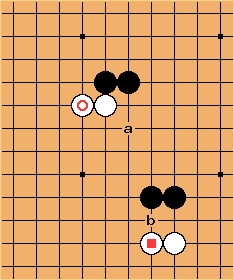 Since very often forces , it is a popular play in many contexts. But not always a good one. The point is that isn't now a well-placed stone. We can make these comparison shapes, in which has been moved from a, or moved from b. Obviously in these cases Black and White have equal influence. 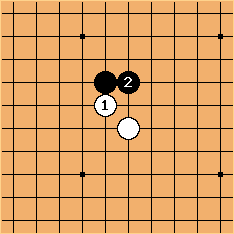 Therefore in the diagonal contact shape White has less than 50% of the influence: the diagonal contact stone seems to be on the 'inside', or to overlap too much with White's initial stone. Suppose is played. 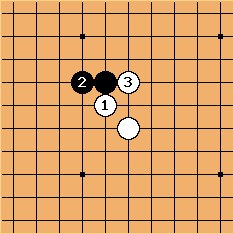 This idea comes in a number of joseki. Now occupies an important bulge point: White has achieved good shape instead. Another fundamental way of thinking is the diagonal as half-way to an eye. 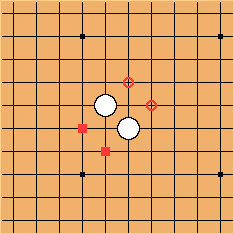 White could hope to build an eye with the two circled points here, or the two square-marked points. 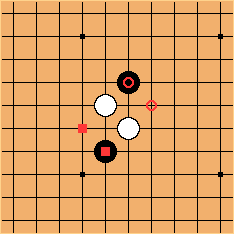 If either of the and stones is in position, White's eye shape is much worse. If both black stones are there, this looks like a pattern with Black on the attack. 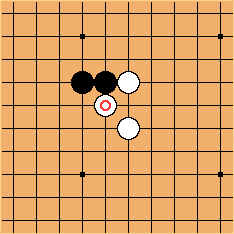 White's plays at the marked points are now bad shape. The page diagonal attachment - as inferior shape discusses further the first of these topics, and compromised diagonal the second. The Japanese term hebo kosumi may well refer to both shapes, made inappropriately.